Bolo Rei – A symbol of the Christmas season in Portugal! Fascinated by this cake I decided not only to buy one but also research its origins. 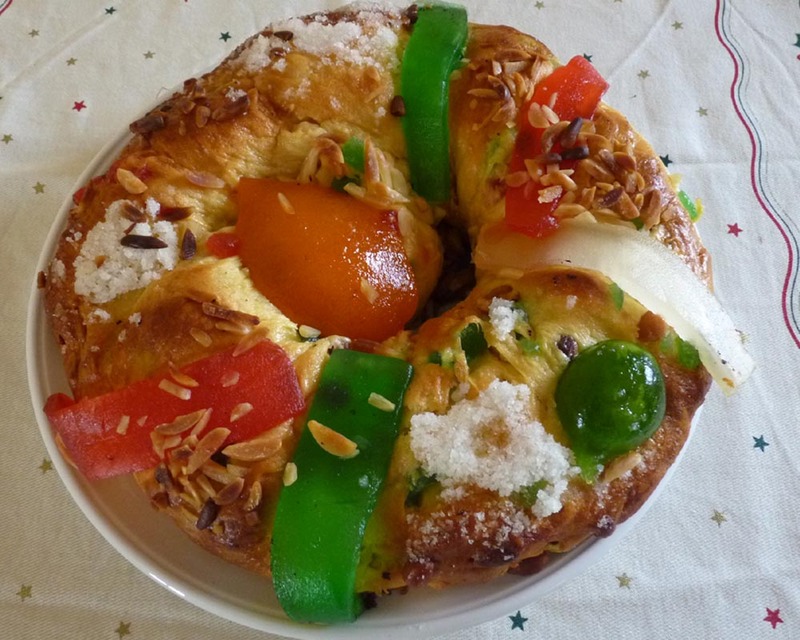 Bolo Rei is not simply a cake but a true symbol of the Christmas season! 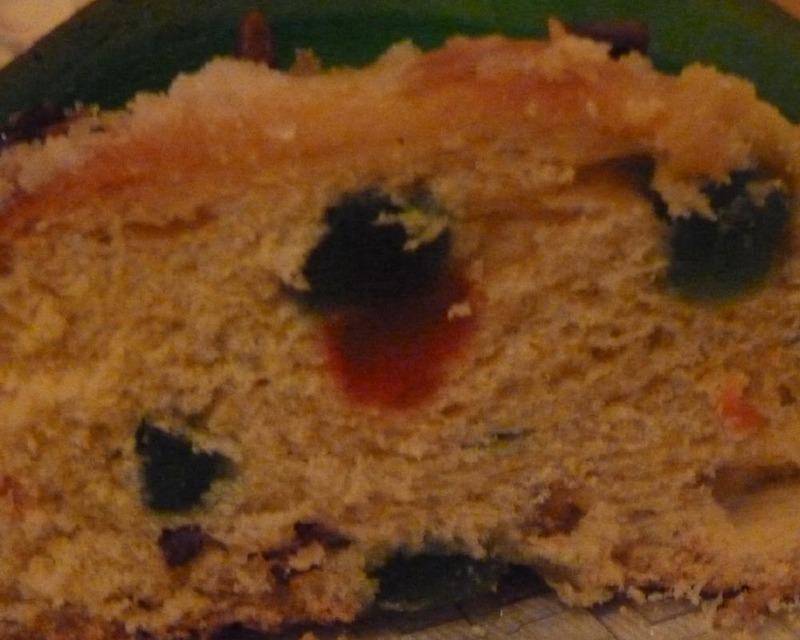 The Bolo Rei (King Cake) originated in France and only arrived in Portugal during the mid nineteenth century. It is traditionally eaten on the 25th December (Nativity) and the 6th of January (Epithany). However, the cake is so popular that it is on sale from the end of November through to the Epithany. The bread-like cake is round with a hole in the centre like a crown and decorated with candied fruits and nuts to symbolize the gifts offered by the Magi. The Magi were the wise men who followed the star from the east to worship baby Jesus in Bethlehem. They were later referred to by the Church, as Kings. Hence Bolo Rei. Inside the Bolo Rei are nuts, candied and dried fruits. There is also a fava bean and according to one legend, a baker added a fava bean to the cake to settle a dispute as to which of the wise men gave the gifts to baby Jesus. The Magi who found the fava, in his slice of cake, was then selected. A family tradition in Portugal is that who ever has the slice with the fava bean has to buy or bake next year’s cake! I bought a bolo Rei from Lidls to present to our guests as a “taste” of Portugal. Unfortunately, nobody liked the highly colored crystallized fruits and the cake, despite having a sell by date of the 5/1/2011, seemed stale. We were extremely disappointed as it “looked” a beautiful cake. Next year I will buy from the bakers and try again… or may even attempt to make my own! Geocaching in Portugal – a new experience and great fun! 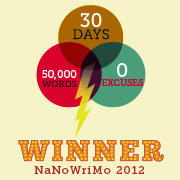 PostADay – PostAWeek WordPress Challenge 2011! The bolo rei from Lidl wasn´t a good choice at all, next time try it from somewhere else, the one from Pingo Doce tastes really good and they usually bake it everyday, bought one today and by the time I got home was still warm. By the way, love your blog… and have a great new year. We have so many kinds of cakes I don’t even know that one with almond paste, but I do know that almond paste (marzipan) is traditionally used in Algarve region. The Bolo Rainha is just like Bolo Rei, the difference is that it doesn’t have those loads of crystalized fruits arghhhhhh ! You’ll be able to find it also in Pingo Doce. In France it’s called La Galette des Rois and has almonds in… although there is a version called Le Gateau des Rois with candied fruit but I have never seen or heard of anyone buying it. La Galette des Rois can be quite dry but correctly done it’s delicious! Happy New Year! Feliz Ano Novo! I would love viit this tea room next time I am up in Lisbon. When I was researching the Bolo Rei there was mention of this, so it would be almost like a pilgrimage! Do you have the address/directions, please as I am not familiar with Lisbon? It’s in Praca da Figueira, a very well known square in downtown, nearby Rossio. Definitely Bolo Rei shouldn’t be bought at Lidl (as you know by now), even Pingo Doce or other supermarket I don’t recomend. Go to a Pastelaria intsead and ask if it is fresh, you don’t even need to ask, since it’s very easy to recognize when is fresh. Riviera or Panito Mole, both in Albufeira do it well. Try also to have “sonhos” and “pasteis de batata doce” and “pasteis de nata”, or even better, “pasteis de belém”, these only in Lisbon. Thank you once again for your advice it is really appreciated! Next year I will definately not be buying from any of the supermarkets so I can fully appreciate this wonderful cake. Next time I am in Lisbon I am def going to the Confeitaria Nacional that Sandra suggested. This resembles the “Couronne des rois” with its candied fruits and brioche, served in France along with the “Galette des rois” which is flaky pastry and almond paste filling. A taste of Portuguese Christmas. Secretly, I still prefer mince pies, Christmas pudding and good old fashioned Christmas cake.